Magic Wednesdays is Nathan's special pretend family playgroup. Nathan has weekly playdate with Maylin, a sighted five year old and Dorothy, a blind nine year old.http://www.dorothycho.com This Magic gang play music, swim, hike, bike, play hide and seek (with vocal clues), ball (wrapped with a plastic bag around so Nathan can hear it), go bowling, feed duckies by the lake, conquer playgrounds, play marbles, jump on trampoline and just have fun hanging out together. Nathan learns how to communicate his challenges to the sighted friends around him and his friends learn creative ways to include him in activities. We named our group Magic because the friendship and experiences we have together are simply magical. 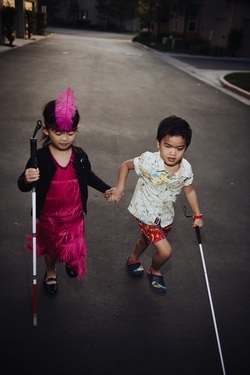 Maylin closes her eyes to experience how Nathan has to navigate with his white cane. Nathan is fearless and loves to lead even without vision. He has been clicking with his tongue to get echo sound clues from the surrounding to sense dangers. Maylin learns to be very patient with Nathan and describes the visual surrounding to Nathan so that he can be included in her world. 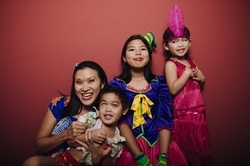 They play Spanish & Chinese counting games, sing songs and play instruments together. This helps Nathan integrate with other sighted children as he is the only blind student in his elementary school. The most touching question Nathan asked me when he first met Maylin was "Can Maylin see with her eyes?" when Maylin wanted to borrow Nathan's white cane to learn how to use it. I answered, "Yes, Maylin can see with her eyes, she just wants to know what it is like to see differently the way you do with your magical ears, magical fingers and your special white cane. This is called empathy, to understand what you are going through. Remember, don't ever feel sorry for yourself because you don't see with your eyes. Your world is very beautiful filled with music, stories, and most importantly LOVE. God made everyone differently." Nathan said sincerely, "I am happy Maylin can see with her eyes, she can share with me the things I cannot see and I can share with her the things she cannot hear". Nathan has learned to accept that blindness is a condition not a weakness or disability. There are limitations to activities that require sight and what he can do and he just has to acquire the skills to overcome them. Maylin is an expert at warning Nathan about dangers, "Curb alert, puddle alert, dog poop alert" when we hike around the neighborhood. My connection with Nathan first came when I placed a ukulele in his hands. He was in awe of this instrument and fell in love with it right away. Since then, Nathan and I have been working on different instruments such as the piano, drums, guitar, violin, harmonica, recorder and keyboard. We share songs together and sing all the time to make us happy. 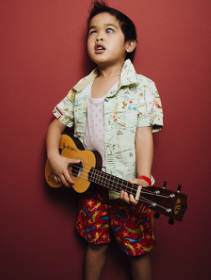 His favorite band is of course The Beatles and his absolute favorite song is Lucy in the Sky which he can play on his ukulele. He also loves some classic oldies such as All I have to do is Dream, Diana, Blue Moon & Stand By Me. Ray Charles, Stevie Wonder and Ellis Hall are his role model for successful blind musician. He also loves Adele, Bruno Mars, Connie Talbot and Train. Nathan has also mastered his Braille alphabets and loves to tell stories. His favorite stories are Goldilocks, Three Little Pig, Snow White, Chicken Licken, The Gingerbread Man and Enid Blyton's stories. I can only describe this special boy as a child who has been touched by God. He has the ability to make everyone around him smile and light up their lives. Japanese songwriter and guitarist Hirotaka Ogawa played the guitar with Nathan and inspired him to compose original songs. Nathan and his AMB family were invited to phenomenally talented blind Jazz pianist Justin Kauflin's movie premiere Keep On Keepin On http://www.justinkauflin.com Nathan hopes someday that he would play the piano as well as Justin Kauflin. He spends hours on the piano every day enjoying the sounds of every note. At 6 years old, he has learned to play an arrangement of Bach's Minuet in G, Beethoven's Ninth Symphony, Beethoven's Rage Over Lost Penny with the generous donated weekly lessons by Mr.Kevin Kao from FreshStart Piano Studio in Irvine. http://www.irvinepianostudio.com Nathan enjoys his lessons with Mr.Kevin as he is incredibly patient and makes lessons enjoyable.